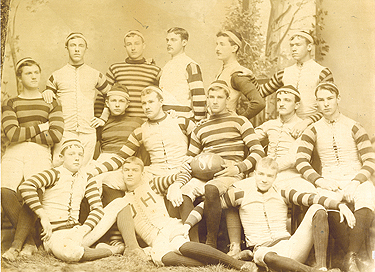 Five years after football was introduced at Johns Hopkins, the 1887 team poses for a formal portrait. The light blue color initially chosen for the uniform's stripes was replaced by a darker shade that wouldn't show as much dirt. The class decided, Penniman said, "that we must have our own football team, and therefore that we must select the Hopkins athletic colors." He said football "was absolutely unknown in Baltimore" then. It was played mainly at Harvard, Yale and Princeton. "And we boys suffered because our friends who went to those colleges were very snooty and patronized us" because Johns Hopkins did not have a football team. A committee, of which Penniman was a member, decided the uniforms should be "black with a light blue stripe." He said that "the jerseys arrived and were beautiful at first, but the light blue stripe showed the dirt so clearly that we changed it to a very dark blue and black as we felt that combination would stand wear better." Their uniforms included "little woolen caps with tassels." Penniman said that at first none of the students knew anything about the game, but they persuaded some graduate students who had played elsewhere to teach them. They practiced in Druid Hill Park, traveling there from the campus near Howard and Center streets by horse-drawn streetcar. He said they "created quite a sensation" as they rode to the park. Penniman said that by the time he graduated in 1884, Johns Hopkins football "had not attained any eminence but several students had learned the game and were quite efficient members of the team." This year's season opener, on Saturday, Sept. 6, pits the Blue Jays against St. Lawrence. The action begins at noon on Homewood Field. This is part of an occasional series of historical pieces by Ross Jones, vice president and secretary emeritus. A 1953 graduate of Johns Hopkins, Jones returned in 1961 as assistant to President Milton S. Eisenhower and was a close aide to six of the university's 13 presidents. GO TO SEPTEMBER 2, 2008 TABLE OF CONTENTS.